A lotion to treat the hair and scalp intensively-Proline and Hyaluronic acid condition the hair, Panthenol and skin identical Lipids treat the hair and hair roots. 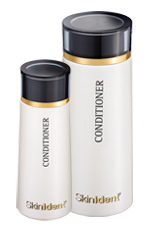 After every shampoo massage the conditioner into damp hair and rinse out after a few minutes. For optimal hair and scalp treatment we recommend it to be used in combination with the SkinIdent SHAMPOO.